There was such wonderful response to take Sharon’s Landscape class from new students that have not yet taken Level 2 that I created a new bundle that includes a short Brush Skills class with Sharon Parker’s Landscapes to make sure that everyone is successful. So much of the skill in Sharon’s paintings is the use of small brushes for details. My Level 2 students have studied this but new students may not have done so yet. I want you all to be successful so the added short course includes a portion of the Level 2 course with information on brushes, brush practice and 3 projects to improve your brush skills. 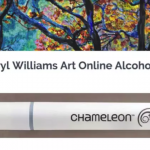 Please join us and find out what taking a class at the Academy of Alcohol Ink is all about. 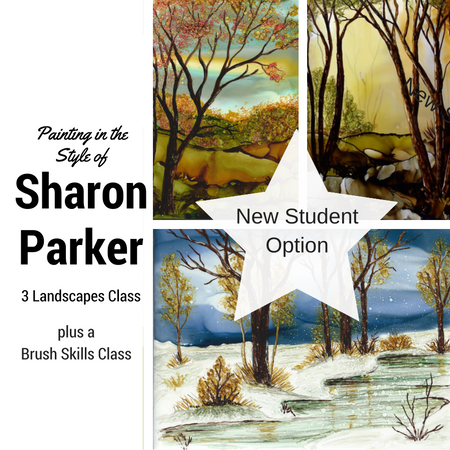 3 responses on "New Student Option for Sharon Parker's Landscape Class"
How do I enroll? Cost? Hi Mary. Click on Shop in the Top Menu. 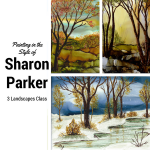 Select Sharon Parker’s Landscape Class – New User Option. The cost is $40 for new students because there is an additional lesson in Brush Skills added so you can be sure to be successful. Click on shop in the top menu. Select Single Painting Classes in the filter on the left and pick Sharon Parker’s Landscape Class.